Patrick Sitwayi lives in Upper Mcambalala with his wife, five children and three grand children. He is 57 years old and has silicosis from working underground in the gold mines for 22 years. He did not receive any compensation for his illness and is unable to support his family without a job. He has to walk with crutches because his toes became infected and were amputated. He says that this is because of the primitive safety equipment and hot working conditions on the mines, causing excess sweating that collected in his plastic gumboots. Leseli Kompi is the 19-year-old son of Maphatsoe Kompi who died in October 2013 from pulmonary tuberculosis (TB of the lungs) at the age of 63 years. 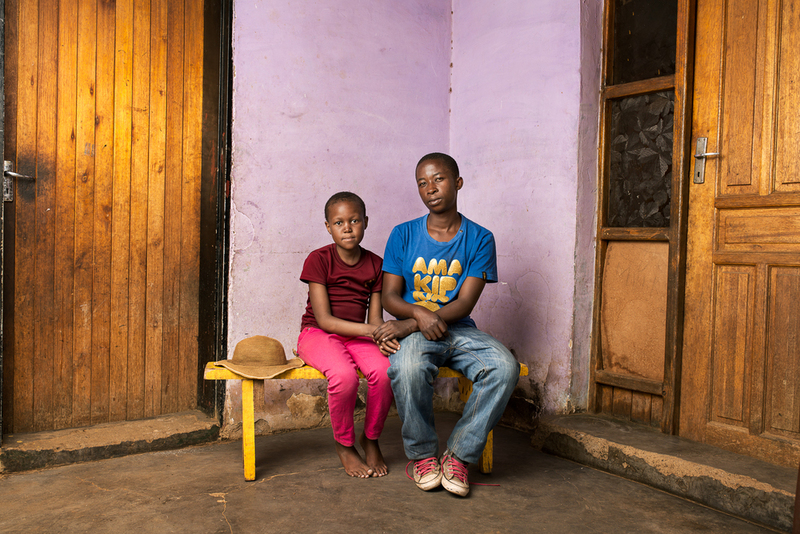 His mother died in 2012 and he is now left to look after his 15 year-old sister, Naleli. They survive off the provident fund, which his father left. The initial amount was R33 367, they are now left with R6 687. Although they have a little money to survive on and Leseli spends his time looking after the animals that his father left, he will soon need to get a paid job as a herd boy in order to pay for his sister’s education. Sekhobe Letsie is 72 years old and lives on the outskirts of Maseru, Lesotho. Born in 1942 he started work in the mines in 1970, when he was 28 years old. He now has four children and lives off the little bit of farming he can manage and money from his son. He is confused about his medical condition and was adamant that he had never been taken for medical screening while on the mines. He has silicosis and has not received any compensation. Mthuthuzeli Mtshange has 8 children. His family live in Flagstaff, 390km from Queenstown. He works as a gardener in Queenstown to make money to send home for his family. He is paid R50 a day (approx. £2.40 or $3.70). He lives in a township on the outskirts of Queenstown as it is all he can afford. Mr Mtshange worked on the gold mines for 35 years and was retrenched without reason in 1996. He was diagnosed with silicosis and tuberculosis and received no compensation from the mines. Makatleho Selibo is the Widow of Mahola Selibo who worked as a team leader at President Steyn mine in Welkom. He worked underground for 33 years. He passed away in 2013 and suffered from tuberculosis and silicosis. He did not receive any compensation from the mines. On the weekends at the mines he would run a shoe repair business, fixing the broken soles of his colleagues; shoes. Mr and Mrs Selibo had four children and she now survives on subsistence farming and livestock. Dyamara Jibhana lives in Whittlesea, Eastern Cape with his brother. He worked on the mines for 39 years and received no compensation when he was diagnosed with silicosis and sent home. He worked at Beatrix Gold Mine in the Witwatersrand Basin in Johannesburg until 2008. He is now 65 years old and waiting to hear whether he will receive some money to help him live with his condition. Zwelakhe Dala passed away on 30 March 2015. His death certificate just states that he died of natural causes. He was 55 years old and was suffering from silicosis. He worked on the gold mines for 28 years and received no compensation when he got sick from exposure to the silica dust. “It is too painful. 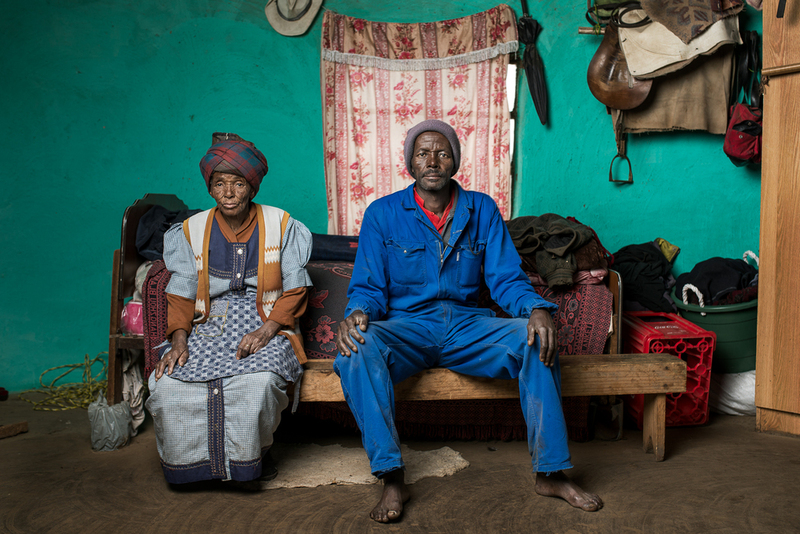 If my husband was not working on the mines, he would still be alive.” says his wife, Nosipho. Mrs Dala raised their five children on her own, for the most part. She is now left with no income except for a small pension. Mncedisi Dlisani worked in the explosives team at Western Areas Mine. He would drill the holes, place the dynamite and light the fuse from a distance away. This exposed him to a large amount of dust. “Sometimes we used masks and sometimes we didn't. There wasn't always a supply." he said. He was diagnosed with Pulmonary tuberculosis (TB of the lungs) and spent nine months in the mine hospital. During that time he did not receive his monthly wage to send home and so his wife, Nokwakha, who had to beg relatives for money to feed her family. He left the job two years later and returned to Butterworth where he spent another 9 months in hospital. After 15 years of service at Western Areas Gold Mine, he received no compensation for his illness. Due to bad weather and poor building materials the walls of their main house collapsed. They now live in a one-room rondavel (round hut) next door as they do not have the money to repair it. Noebejara Tau is 70 years old and lives in Mafeteng, Lesotho. He worked on the mines between 1972 and 2000 as a loader driver. He was diagnosed with silicosis and retrenched. Although he did receive a small amount of compensation, he now has to depend on subsistence farming and bartering with his neighbours in order to acquire the food he needs to feed himself and his wife. Monde Mxesibe lives alone in Zagwityi near Butterworth in the Eastern Cape. He is 62 years old and worked on the mines for 26 years. He has Pulmonary tuberculosis (TB of the lungs) and in 1996 the mine told him that he would be compensated. He has still received nothing. He says that the scariest thing about working on the mine was the lift journey to go underground. About 75 people would cram into a three-storey cage, which was held by just one steel cable. He heard that the rope had once broken on another mine and everyone in the lift had died. He tried hard not to think about it and focused on the money he was making to send home to his parents. Mr Mxesibe’s big dream in life was to own a car but he never managed to save enough money. Toulang Mako, 65, lives in Mohale’s Hoek, Lesotho. He worked on the mines for 21 years as a miner’s assistant and would sing in a traditional group at the weekends. During this time he contracted tuberculosis on three separate occasions and in 2012 he discovered that he had silicosis. Although he had a medical when he was retrenched he was not informed about the silicosis and was never compensated. Masiko Somi fell sick while home on leave. He had been screened at work but had not been told that there was anything wrong with him. He travelled to see a private doctor in Kokstad in KwaZulu-Natal who advised him to stay at home for a while to get better. He could not communicate with the mine and when he returned to work he was dismissed because he was late. 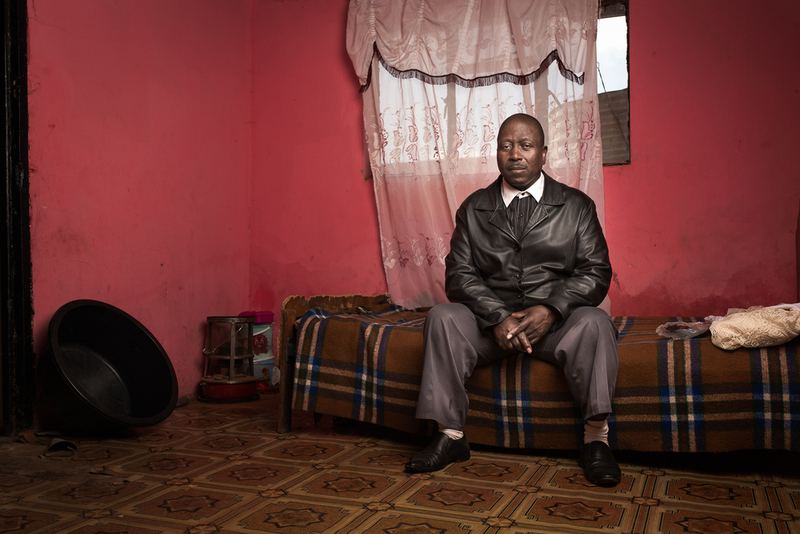 Masiko had worked at President Steyn Mine for 19 years and was not compensated for his silicosis. “I have tried to get work for the last 20 years but my health has not allowed me to,” he said “ We survive by getting temporary jobs from neighbours, building fences and ploughing mielie (corn) fields”. Nanabezi Mgoduswa now works as a security guard at Mantshangase Clinic inBizana in the Eastern Cape. Although he suffers from silicosis and drug-resistant tuberculosis, he has to support his wife and two children as he received no compensation from the mines when he was dismissed in 2009. During his 21 years on the mine he would take part in traditional dance competitions with his group named Sondela (Come Closer). Xolisile Butu is 60 years old and lives in Skhobeni in the Eastern Cape with his 86 year old mother Adelaide. His wife works in Komani and earns the money for the household - she only comes home once a month. Mr Butu was diagnosed with pulmonary tuberculosis (TB of the lungs) in 1992 after working on the mines for 7 years. He received R1000 (approx. £50 or $72) in compensation. Mr Butu recalls what he calls “the problems between Xhosas and Zulus” on the mines. The fights got so bad that the police would be called and would break them up using teargas. After a while they started to live in separate dorm rooms. Matona Mabea, 62, was a team leader in Randfontein Mine where he worked for 30 years. He is from Ha Makoanyane in Lesotho and would travel to South Africa for work. Initially they would come home every six months, but as the borders became more controlled, they would only be allowed to cross the border once a year. Now that he has been retrenched, with R27 000 compensation for silicosis, he supports his wife and children by growing maize meal and exchanging it with his neighbours for other food. When they need money, they rely on their daughters to send money home. Kenneth Nqose, 57 years old, lives in Lower Woodhouse in Cofimvaba in the Eastern Cape. He has been married to Nonuseko for 30 years and they have three children. He was diagnosed with tuberculosis and silicosis in 1997 and spent two months in the mine hospital. During this time he was retrenched and given R18 000 (approx. £850) as a retrenchment package. He was given no compensation for his occupational illness and was sent home where he had to pay his own medical bills. Mr Nqose was not present when either of his children were born. Mrs Nqose would write him a letter to inform him about the new child. The baby would then stay unnamed until she received a letter back after several months giving his chosen name for the child. Thembekile Mnaheni asked to be retrenched from his job as a winch driver as he was suffering with a persistent cough and swollen feet. He was told that he could not work underground any longer so he asked to go home. After leaving the mine he found out that he had silicosis and after 23 years has received no compensation. He now survives on just R1 410 per month from hissocial support grant, which has to pay for his food, transport and funeral cover. He has not stopped coughing since 1998. Buzile Justice Nyakaza is 62 years old and lives in Upper Mxe, Cala in the Eastern Cape. His home is about 45 minutes from the nearest town and is only accessible by foot, horseback or 4x4 vehicle. He worked on the gold mines for 32 years and received no compensation when he was diagnosed with silicosis. As he was away from his wife Nowongile and 6 children for at least half of the year, he would send money home via the post office. He would walk to the nearest town outside the mine and deposit R2000 (approx $146) every month. Mrs Nyakaza would then have to make the two-hour return trip by public transport to the post office in Cala to collect the money. Monokoa Lepota lives in Roma, Lesotho. He was working in the gold mines when he injured his eye in an accident and was retrenched with compensation of R70 000. After he returned home he discovered that he has silicosis from his 36 years working underground. He cannot go back to work in the mines and so has to support himself by farming. Zwelengaba Mgidi spent all of his free time training to be a boxer while he was working at Harmony Gold Mine. He fought under the name “Fix” and would train after work during the week and compete at the weekends. Now he says that he cannot even walk to the gate in his garden without getting out of breath. He is 55 years old and has silicosis. After 34 years working as a winch driver and team leader he was compensated R83 000 (approx. £4,000) and sent home. Matiisetto Nong is the widow of Samuel Leponesa Nong. She is 58 years old and lost her husband in 2007. He worked on the mines for 31 years and was taken home to Lesotho in a company ambulance when he was retrenched due to 2nd degree silicosis and tuberculosis. He did not receive any compensation. After he was retrenched, the mines promised to recruit his son but did not end up employing him when he went to the mine. His son ended up looking after his father until he died. 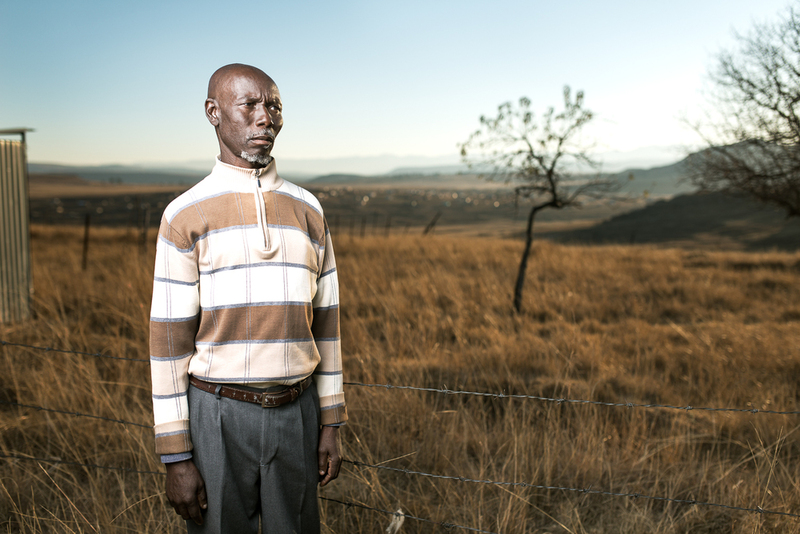 Malungisa Thole worked at Western Areas Mine for 19 years and was paid no compensation when he developed silicosis. In his spare time he taught himself to weld and now supports his family with his small welding business. Landile Qebela, 52 years old, has nine children and works as a security guard now that he cannot work in the mines any longer. He has silicosis from his 32 years service at Vaal Reefs Shaft No 8 and received R52 000 compensation in 1995 (approx. £2,460 or $3,730). He stayed at the mine for another 5 years working as a locomotive driver on the surface until he was retrenched because they could not find a suitable job for someone so sick. Mr Qebela went to find work in the mines when he was 25 years old because his mother became sick and he needed to make money to provide for his sister's future. He managed to send enough money home over the years to support her until she gained her teacher’s certificate. Manthatuda Josephina Lebina is the widow of Liphang Lebina and lives in Ha Mpo, Maseru in Lesotho. She is 72 years old and has to survive by selling vegetables. Her husband was never compensated when he became sick with silicosis. He worked on the gold mines for 10 years as a store attendant at Free State Saaiplaas and a boilermaker and locomotive driver at President Brand. Joseph Lebone started working in the gold mines in 1972 when he was 21 years old. He worked for 33 years until he was diagnosed with silicosis at the mine hospital. He was compensated R40 000 and only sent home when he developed tuberculosis. He started working there because he saw others who were managing to find jobs and provide for their families. Now he has to survive off the land. He grows vegetables, maize and wheat. Vuyani Elliot Dwadube worked for 10 years as a brick maker in Cape Town before going to work on the mines. He worked for 16 years at Harmony Gold and was retrenchedin 1995. He has pulmonary tuberculosis (TB of the lungs) and did not receive any compensation. His wife, Pamela, works as a domestic worker and nanny at the same house in Virginia in the Free State where he works as a gardener. Thulenkho Kuswana, 57, was a winch driver and worked on the mines for 33 years. In 2009 he was diagnosed with silicosis and was told to go home and wait for compensation. Six years later and he has still received nothing. He recalled a time in the late seventies when he was called to help rescue other miners that were trapped underground. They managed to rescue 13 people but three others lost their lives. Maleburu Lebitsa is the widow of Lekhoanyane Isaacs Lebitsa. She is 60 years old and lives in Leribe, Lesotho. Her husband died in 2010 after leaving the mines four years earlier due to his occupational lung disease. They were married in 1977 and for the next 33 years he was away from home most of the year. “He came home, but I was practically raising the children alone. He would send money home every month, about R800”. Mzawubalalekwa Diya, 60 years old, fell sick in 2003 when he was working at Goldfields Mine. He was coughing up blood and admitted to hospital. He was retrenched two years later and was never given the results of his exit medical examination. When a law firm took him for an x-ray it was discovered that he had silicosis. After 27 years of service at the mine he did not receive any compensation. His wife, Macetshwayo, now supports them by working as a cook at the local school. Mr Diya was part of a traditional singing group called Abavukizi (Gold Diggers) who used to write and perform on their days off. When a group of workers were trapped underground, they wrote a song to celebrate and thank the mine for the rescue operation. Mataso Makone, the Widow of Molupe Makone, is 51 years old and lives in Butha Buthe, Lesotho. Her husband worked on the mines for 33 years, between 1974 and 2007 and died from tuberculosis in 2011. He was retrenched due to his medical condition but never received any compensation. Now she has to survive with money she receives from her daughters who are domestic workers in South Africa. Speaking about why she married a miner she said that they met when she was 16, he sent a friend to tell her that he was interested. “I liked him a lot also,” she said. “Since he was already working I felt safe with him because I knew he was going to provide”. Bangumzi Balakazi is 61 years old and lives in Peddie in the Eastern Cape Province, South Africa. He worked on the mines for 25 years and was diagnosed with silicosis. The mines paid him R45 000 in compensation. His daughter Zintathu lives at home with him and helps to look after him when he is struggling with his illness. Watu Livingstone Dala h was attending a funeral in the neighbouring village when I visited him. We collected him afterwards and took him back to his home in Mdantsane in the Eastern Cape where he told us about the time that a huge underground explosion almost killed him. He recalls that the dorm rooms they lived in slept between 12 and 16 men on steel bunk beds with sponge mattresses. Work cycles were six-day weeks for 13 months at a time. All of this they endured for a wage of R2 800 per month (approx. $204). Mr Dala was diagnosed with 1st degree silicosis and was given R37 000 (approx. $2,704) when he left the mine, due to ill health, after 25 years working in the industry. Mantso Mokoena was born in 1962 and started working in the mines in 2001. Before he was a miner he worked as a policeman. He left the police force because he felt that even though the mine work was hard and paid poorly, it was a better option than being in the police force during apartheid. He was diagnosed with stage 2 silicosis in 2007 at the mine hospital and continued working until the laws were changed in 2009 and the mine was no longer allowed to employ him due to his illness. Mr Mokoena was one of the few miners who received a good education before he went to work on the mines. This meant that he had the tools to retrain after he was dismissed and he is now working as a paralegal in Welkom in the Free State. Zonisele Nkompela is 73 years old and works as a gardener for a family in Queenstown. He lives in Linge township about 25 minutes by minibus taxi ride from his home. He is paid R85 per day (approx. £4 or $6) plus money for transport. With this money he must support his family who live far away in Qoqodala. He goes to visit them once a month but then returns to Queenstown as this is where he is able to find work. Mr Nkompela worked for 29 years on Harmony Gold Mine and was paid R36 000 (approx £1,735 or $2,700) in compensation when he was diagnosed with silicosis by the mine doctor. Malepa Puso is 62 years old and lives in Welkom in the Free State. He lives with his wife, Mantwa and their four children in the house that he bought from the mines after it closed. He worked at Free State Geduld mine for 24 years and worked his way up from being a winch driver to a supervisor. He has 1st degree silicosis and received R30 000 in compensation. He now works as a gardener at the local school. Motlalepula Mokoena, 71 years old from Maseru in Lesotho. He worked on the gold mines for 38 years as a loco driver and a team leader at Freestate Saaiplaas and Free State Geduld mines. He was retrenched in 2002 and paid R36,000 in compensation for his silicosis. He now receives an old age pension and lives alone as his wife has died and his 4 children have left home. Mona Melao lives in Maseru, Lesotho and is 48 years old. He worked as a loader driver for Free State Geduld mine between 1985 and 1996. While he was on the mine he was a keen soccer player and a good boxer. In 1993 he sustained a leg injury and while in hospital it was discovered that he had tuberculosis and silicosis. He now has a wife and three children to support and works for his brother driving taxis. Ezekiel Mutsana Masupha is 61 years old and is originally from Lesotho. He is now staying in Welkom in the Free State. He worked in the mines for 37 years and has silicosis from exposure to silica dust underground. His poor health prevents him from working and he survives off a social grant and a pension. To supplement their income his his wife is farming in Lesotho but his children are living in South Africa. Matela Hlabathe had tuberculosis three times while working on the mines. Each time they treated him, but they didn’t move him, he continued to stay in the hostel. After 36 years working underground he took a retrenchment package and now lives off a government pension of R1 410 per month. He has pulmonary tuberculosis (TB of the lungs) and received R39 000 compensation from the mine. Zimoshile Bozo is 57 years old and lives in Hofmeyr in the Eastern Cape province. He worked on the mines for 27 years at Blyvooruitzicht Gold Mine and was diagnosed with silicosis in 2008. He didn't receive any compensation and now has to rely on his sister to care for him, as he is unable to find work. He lives with his sister and her children in a small three-room house in the township outside Hofmeyr. Zamukulungisa Dyanti lives with his wife and 6 children in Lower Seplan in the Cala district of the Eastern Cape. We arrived at his house just as it was getting dark and his son had to move the one light bulb that they owned from room to room in order for us to be able to see what we were doing. He worked as a winch operator at several different mines including Free State Geduld, Western Deep Levels, President Brand and President Steyn. He was diagnosed with silicosis in 1993 and received no compensation for his illness. Agrippa Dlisani, 60 years old, was a loader and sweeper at Bracken Gold Mine. He went to find work at the mines because his father passed away and he became responsible for supporting his mother and brothers. He spent six months in the mine hospital with pulmonary tuberculosis (TB of the lungs) in 1983 and was retrenched in 1989. He now washes cars in Butterworth for R50 a day (approx. £2.40 or $3.60). Mr Dlisani’s hope is that they win the case against the gold mines so that he can get enough money to pay for further education for his children. Siqhamo Hoyi lives in Peddie in the Eastern Cape province of South Africa. He is 57 years old and worked on the mines for 27 years. He has been diagnosed with Pulmonary Tuberculosis (TB of the lungs), which, he believes, is a consequence of working on the mines for so long. Luduko Enoch Madindala is 53 years old and lives in an old mine house in Welkom. When the mines closed down they sold off the accommodation to the miners and their families. He worked on the mines for 29 years and played soccer for the mine team The Lorraine Lions at the weekend. “In the hostels we would stay with 15 people in one room. The food was bad, even the toilet was next to the kitchen. The bed was cement with a thin mattress and people would smoke in the rooms.” Madindala believes that the mines abused them. “We worked very hard and there was not enough money.” When he first started they would earn R136 per month and by the end they were taking home R1 600 per month. Zolisa Jejana, 56, was diagnosed with Pulmonary tuberculosis after he had left his job on the gold mines. He was retrenched in 1989 due to his participation in a three-day strike where 59 miners stayed underground for three days. At the time they were earning R1000 a month (approx. £50) and were demanding a wage increase. All 59 miners were retrenched. Mr Jejana received no compensation for his illness and now tries to pick up casual work as a bricklayer. With the small amount of work he can get he needs to support his wife and 6 children.